Add chocolate cookies into a food processor to make crumbs. Melt the butter, let it cool and then add it to the cookies. Mix it well. Press the cookie mixture into a 9 round springform pan. Bake for 10 minutes at 350°F. Remove the ice cream from the freezer to let it soften a little. Not melted, just soft. After the crust is cooled, add 1 pint of dulce de leche ice cream and spread evenly on the bottom. Swirl caramel on top and then add a layer of pecans. Freeze for 15 minutes until the layer has harden. Repeat this process twice, using chocolate ice cream then dulce de leche ice cream again. Once all of the layers have been added, freeze the pie for at least 6 hours or up to two weeks! Add a good amount of whipped cream and caramel to the top before serving. I love a good ice cream pie and this one doesn't disappoint! Mile High Turtle Pie is rich, creamy and just darn tasty. 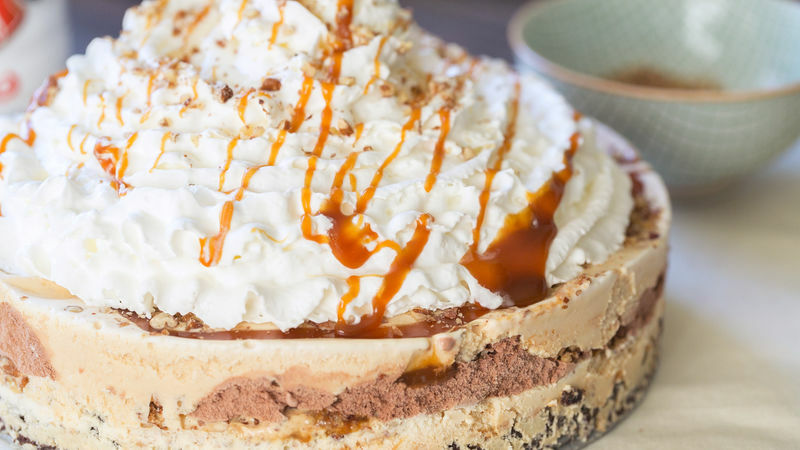 It consists of three layers of dulce de leche ice cream and chocolate ice cream, with caramel and chopped pecans in between all of the layers , then all on top of a chocolate cookie crust. Before serving, add a giant layer of whipped cream, drizzle with caramel and sprinkle on a few more pecans. This ice cream pie is a delicious dessert you can make ahead of time. It needs at least 7 hours to freeze all the way. It will also keep for up to two weeks in the freezer! So impress your guests with this turtle pie and watch their delight as they enjoy each gooey, delectable bite!